The second quarter in Denmark has not only witnessed a dramatic improvement in the weather – most Danish companies have also seen their reputations increase among the Danish population at the same time. 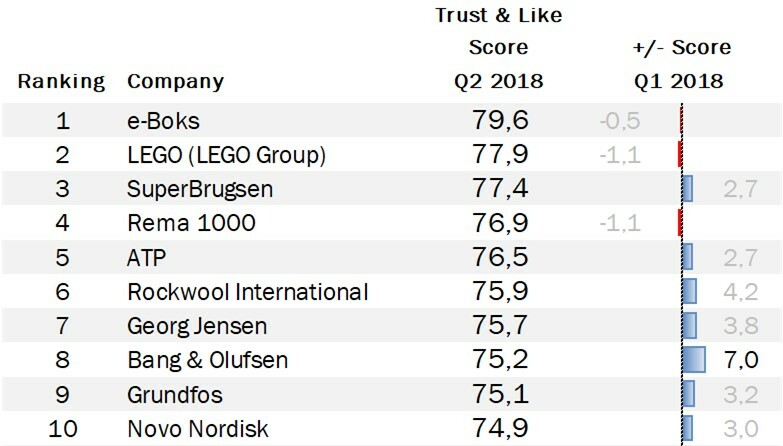 The average Trust & Like Score for the 100 most prominent Danish companies has grown for the 4th consecutive quarter, now reaching 64 points. Whether it’s Danish businesses doing more to win people’s trust, or the Danes becoming a little less negative as they exited the winter period, is hard to say – but it’s good news for business in any case. And while it has been relatively modest changes for most of the companies covered by our ranking, there are as always some interesting stories to tell. Danske Bank has, yet again, made the headlines with its ongoing money laundering scandal, concerning the bank’s past gains in Estonia from suspicious schemes involving Russian oligarchs. This has, not surprisingly, battered the already weak Danske Bank reputation further to an all-time low rank of #97, where it now enjoys the company of L’Easy, Saxo Bank and PostNord. Interestingly, the fall of Danske Bank has had the opposite effect on the Danish banking industry in general. Nordea, Nykredit and Arbejdernes Landsbank have all seen significant improvements in their Trust & Like Score in Q2, jumping around 20 positions each in the ranking. In fact, the top 5 Danish banks besides Danske Bank (Arbejdernes Landsbank, Jyske Bank, Nordea, Nyrkedit and Sydbank) have on average improved their reputations by 5 points during the time that Danske Bank’s story was all over the news. This not only shows that the misery of one can be the fortune of others – as is often the case in corporate reputation – but it also suggests people view the scandal not as an industry problem, but rather as a specific Danske Bank failure. A few years ago no brand and reputation ranking would be complete without Novo Nordisk, Bang & Olufsen or Carlsberg in the top 10. During 2017 and early 2018, however, that was certainly not the case, and many started wondering whether these old reputational stars would ever shine again. Well they are certainly shining brighter now. In our 2018 Q2 Denmark Top 100 ranking we see Novo Nordisk, Bang & Olufsen and Carlsberg all improving their Trust & Like Score and rocketing 10, 25 and 34 positions up the ranks respectively. On the back of its long-absent financial success and excitement around its Play product range, Bang & Olufsen is now back in the top 10 in 8th position, while Novo Nordisk is at 10th and Carlberg still at 22nd but moving rapidly upwards. Fake news, data privacy, abuse of market position – it seems that bad publicity is in abundance for Google, Apple, Facebook and Amazon. Yesterday’s reputation role-models are increasingly lost in a tidal wave of mistrust and dislike, placing them all in the second half of the ranking: Google at #69, Amazon at #73, Apple at #75; and Facebook scrapping the very bottom at #96 (hello, Danske Bank!). This reputational trend is remarkable given that all these companies keep innovating and embedding themselves deeper and deeper in people’s lives and lifestyles. This begs the question: how long will people stay loyal and remain happy letting these companies into their homes and private lives with this growing mistrust? Do people even have a choice? Perhaps not right now, but the growing dislike may increase the probability of defection when the opportunity arises. It’s not yet clear to what extent the GAFA companies care about this problem – at least in Denmark. When focusing on the biggest “winners” and “losers” it is easy to miss a truly remarkable story: when DONG had announced its rebranding to Ørsted at the end of 2016 everyone and their dog criticized the company for its choice of new name, color scheme and corporate story. Even the descendants of the great 18th century Danish scientist sued the company for using their family name. Yet a year and a half later, it seems that the change from DONG Energy to Ørsted has been a reputational success. The company’s Trust & Like Score has been steadily improving since the rebranding – for five consecutive quarters in a row! A phenomenon never before seen in our ranking. From the perspective of turning around public perceptions, this is truly a case of “Successful Rebranding 101” that other marketers can learn from – within and outside the energy sector.